Business, more than any other occupation, is a continual dealing with the future; it is a continual calculation, an instinctive exercise in foresight.”—Henry R. Luce, founder of Time, Life, Fortune, and other business magazines. In the summer of 1988 in Yellowstone National Park, fires raged across 793,000 acres, causing unprecedented damage and threatening wildlife extinction. By September, more than 36% of the park was burning, causing a complete closure for the first time in history. Only the arrival of Mother Nature and her autumn temperatures with cool, moist nights calmed the seas of the firestorm. With the park’s popularity growing to a rate of 10 million visitors a year, Yellowstone was long viewed as the cornerstone of the National Park Service (NPS), a national treasure that needed to be “managed.” About a decade before the fire, the NPS began a series of discussions about how to go about “managing” the natural aspects of the park to protect its visitors from any potential harm. Could it create a sort of natural theme park to maximize the attractions, serving as the “wizard behind the screen” to create a wilderness experience for all? That’s exactly what they endeavored to do throughout the 1970s as the popularity of the park expanded. What they could not, and did not, account for was the random act of chaos—a lightning strike that would scorch the earth in seconds, lighting up a decade of underbrush gone wild. While fires are common in forests, the scale and scope of this 1988 fire was fueled by the actions taken to control the very “wildness” of a complex adaptive system. Complex adaptive systems are what this article is about (and surveying too, but more about that later—stay with me!). And it is the relationship of complex adaptive systems in nature that mirror complex systems in business today, as in centuries past. Yellowstone’s ecosystem defied human efforts to tame it. The park service tried to instill a level of equilibrium in the wild by quickly putting out fires, feeding wildlife for the viewing pleasure of tourists, and overall denying the natural rhythms of fire cleansing and renewed growth. By denying the natural acts of chaos to shake the system and spark new growth (and innovation—hence the coming connections to the business world), what they got was a conflagration beyond their wildest imagination, but one that sparked new policies for national park management that exists even stronger today. What applies to forests applies to the business world as well. 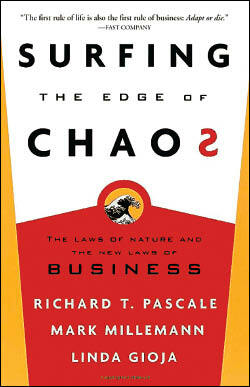 “Prolonged equilibrium is a precursor of disaster, whether it happens unwittingly or, as in Yellowstone, by intent.” Richard Pascale wrote this in his book, Surfing the Edge of Chaos. He said the survival of any system depends on its capacity to cultivate variety, not just tolerate it, within its internal structure. If one fails to embrace change into its systems, that living system will fail due solely to its inability to cope successfully when change is forced upon it. And change is a living chaos—it cannot be controlled, it cannot be predicted, and it cannot be avoided. But it can be managed, and it can be leveraged. A great example of this is a simple goldfish in a bowl. If minimal effort is given to feed it and care for it and protect it from predators, it can live a life of relative peace for a long time. But such fish are abnormally affected by even the slightest, tiniest change in living conditions and are unable to thrive almost immediately. By contrast, fish in the ocean are far more capable of surviving because their living conditions change so rapidly with almost endless threats. The lesson of Yellowstone makes us uncomfortable. We attribute equilibrium with balance in life. Surely it is a “good thing” that we have a slow, steady, orderly method to our world. Disequilibrium equates to an off-balance of the seesaw. The book says, “Balance occurs in nature when the components of a biosystem are in sync. But when a fire in Yellowstone abruptly alters the stable environment, that which has remained latent (debris on the forest floor, or, in the business world, unmet consumer needs) can suddenly become manifest. Coping mechanisms that have atrophied during long periods of equilibrium usually prove inadequate for the new challenge. Without adventure, civilization is in full decay.” When a long period of stability lulls a company into equilibrium, that condition is tantamount to a death sentence. The people within the company no longer have the tools at their disposal to adapt and respond to the slightest change. In 1839 Charles Darwin studied the ecological system of the Galapagos Islands to determine if a stable, natural community of living systems was at peace with itself in an isolated habitat. Surprisingly, what he found was turmoil. In his oft-quoted book, The Origin of Species, he said that living species experience a constant struggle to live, survive, and thrive. Chaos erupts at unknown times and in unknown ways, but it is the complex living system that responds and thrives because it has learned new tools to adapt to change almost immediately. Like all complex adaptive systems, corporations, no matter how large or small, must be ready for a sudden confrontation with the hazards of natural selection. A good example of this is Garmin. Garmin’s business plan for nearly five years was predicated on the purchase of an expensive “gadget’ that was hardwired into your car. Once you turned it on, you could access their proprietary system of navigation maps and destination routes to a pre-set address point—with road data being the scarce commodity. What they didn’t account for was the introduction of Google Earth and its entry into the navigation business. By partnering with Verizon Wireless and other manufacturers of personal phones, Google could leverage their Earth-mapping data and offer free GPS driving directions for mobile phones. It already had all the road data, so it cost Google almost nothing to provide the service. Did you hear that rush of air that just went by? That was the wind knocking out the sails of Garmin’s business plan. “Human beings are extremely well equipped with consciousness and the capacity of foresight …human beings not only learn behaviors but incorporate them into their cultural DNA,” Pascale states in his book. equilibrium enforcers to your door. The enforcers are the social norms or core beliefs about the profession or business —in surveying they would be characterized as resistors to new technology like GPS or modeling or beliefs that the practice of surveying can’t evolve, or be affected by, the emergence of digital technology. This poses a grave danger to a company because the enforcers prevent new genetic material—ideas, innovations, and changes to systems or operations—from inhabiting the entity. The enforcers are strong enough to neutralize new ideas, much the same way that our own body’s immune system seeks to eradicate foreign substances. And we are then back to that old paradigm—equilibrium sets in, and death is eminent. My point is that while clear similarities exist between business and nature, we have one clear advantage—as humans we are capable of seeing our future, of recognizing danger,and we can mobilize to take action. It is that DNA structure that makes us unique. And as surveyors, frankly, we need to do a better job, within both our own businesses and our profession, to change. Our ability to learn from our mistakes, or from advantages and opportunities proposed by others (such as the emergence of new technologies like lidar or 3D modeling), is what makes us a superior living system above all others. We need to cultivate that skill, qualify and categorize our learning into professional discussions, advancements in the profession, development of new techniques, and more. We can, and should, incorporate this new genetic material into our DNA. “Our collective failure to translate conscious awareness into effective organizational response is captured in the declining survival rate of the Fortune 500 over the past 25 years … why didn’t they remain on the list? Truer to Darwin’s theories than we would wish, learning and proactive response did not take place. A significant percentage of organizations failed to mobilize the level of response needed to sustain ourselves,” according to Surfing the Edge of Chaos. What are we doing as a profession to sustain ourselves? Are we elevating the discourse among our employees in the business? Are we challenging the process among our peers at local association meeting or other business gatherings? Are we advancing ourselves toward new ways of business modeling, strategic planning or simple forecasting? As employees, are you initiating discussions about the processes and prevailing “norms” with your manager? As a business owner, are you engaging in creative discussions about how to examine your own areas of “familiarity” and explore new ingredients for success and innovation? Are you thinking about reading this book? We can’t stop the waves of the ocean from churning, but we also cannot sit idle in the comfort of the calm parts of the ocean, that place of “equilibrium balance.” We need to find the sweet spot—that place on the edge of chaos that allows us the freedom and excitement to look ahead, to question and explore, and to use our natural-born DNA to examine ways to reinvent ourselves and sustain high levels of responsiveness and nimbleness that will help us survive and thrive. “The point is: over time (and even concurrently), organizations need evolution and revolution. When they have been limited exclusively to the restrictive precepts of social engineering, they have been handicapped and largely unsuccessful in unleashing authentic revolutionary change. The principles of living systems offer a powerful new recourse. The trick is to clearly identify the nature of the challenge and then use the right tool for the right task,” according to the book. Part two is about how surveyors can find the sweet spot on the edge of chaos. Steve Boddecker, PLS, is executive vice president of the New York State Association of Professional Land Surveyors and survey manager for Fisher Associates, Buffalo. He participated ina year-long executive leadership institute where Surfing the Edge of Chaos was a cornerstone of business thinking, discussions, and study. Editor’s note: This story (in full) first appeared in the November 2010 issue of Empire State Surveyor, a publication of the NYSAPLS.